I’ve been reflecting a lot recently on what a difference it makes to a person’s life when they understand their place in the bigger picture of the spread of history and God’s plan. I’m reading Terry Virgo’s book ‘The Tide is Turning’, part of which is a study of the life of Nehemiah. 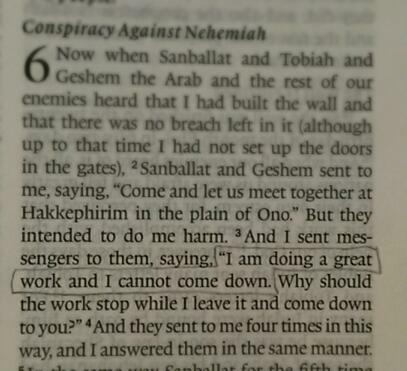 Yesterday I was reading about how Nehemiah overcame all the opposition thrown at him. One of the points was taken from this verse. Nehemiah knew the task he had been given and thus was able to recognise distractions when they were thrown at him. What a connection! Knowing what he was up there for gave Jesus the strength to stay the course in the midst of agonising torture. Knowing what he was up there for gave Nehemiah the strength to stay the course amidst distractions, mockery, insults and slander. Knowing what we are here for should similarly give us the strength to stay our own courses when the going gets tough – or even just mundane or tedious. My snippets are going to be a bit random and sporadic for a while, because I’m studying Richard Foster’s Celebration of Discipline, rather than simply reading through a book of the Bible. This week’s discipline is meditation – and I’m finding it a real challenge just to sit in God’s presence and meditate on Him and His word, and not then talk about it. I managed to resist yesterday, but today something similar jumped out and I just had to share it! 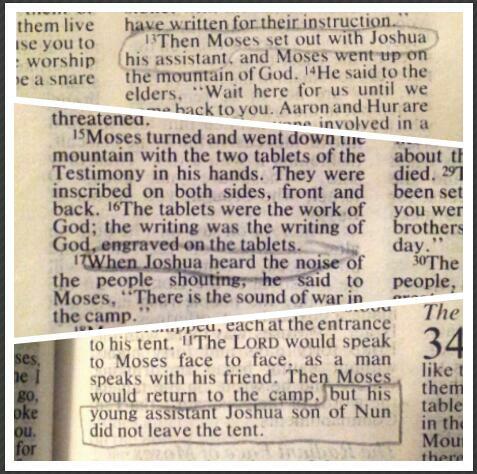 I had never noticed before that Joshua was right beside Moses on Mount Sinai and later in the tent of meeting. Aaron wasn’t allowed to go up into the presence of the Lord, the people weren’t even allowed to touch the foot of the mountain, but Joshua seems to have been right there beside Moses all the time. Sometimes the leaders – the ones with position, authority and prestige – are not the ones we should be seeking to emulate. It was the assistant who got to enter into the presence of God and stand close by as the Lord Almighty revealed himself to Moses. What a privilege, and what a lot it says about Joshua’s character that he was trusted, that he had the courage to enter God’s presence when the people were too afraid (Ex 20:18-21), and that he was acceptable to God – the death penalty of chapter 19 was withheld from him. This is a fairly random snippet, because I’ve done Acts already, fairly recently, but today I was reading a study guide on prayer and it sent me to this passage. 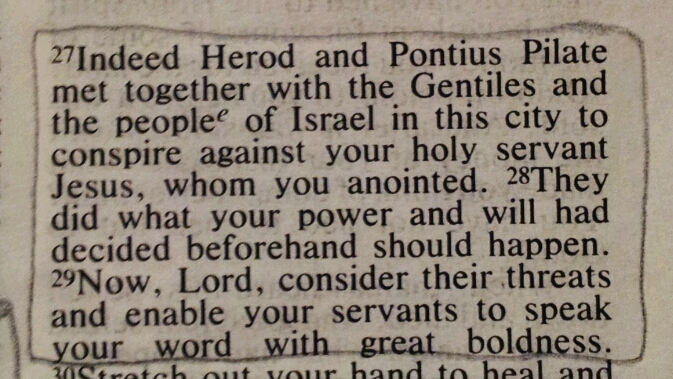 It had never struck me before what a courageous prayer this is. To put it in context, Peter and John had just spent a night in prison at the hands of the priests and the Sadducees, and had then been questioned by them about their audacity in preaching about Jesus. They had let them go, more because they feared the people than anything else, and Peter, John and the other believers knew that wasn’t the end of it. So what did they pray? Not ‘please protect us from the religious leaders’, not ‘please stop your opponents in their tracks’, not even ‘please help them see the truth’. What faith! What courage! What a difference from the way we often pray!